This year's festival will be held Saturday September 7, 2019 from 10:00 a.m. to 7:00 p.m. and Sunday, September 8th from 10:00 a.m. to 7:00 p.m. at the Pittsburg Marina. The Pittsburg Seafood & Music Festival has long been one of the keystone events in Contra Costa County. This gastronomic extravaganza features lots of tasty treats including gumbo, crawfish, BBQ oysters, steamers, muscles, chowder, fish & chips, lobster rolls, alligator on a stick, corn on the cob and an array of all types of foods for every taste! The Pittsburg Seafood and Music Festival provides a safe and enjoyable environment for the whole family with a wide variety of arts and crafts on display, amusement rides for the kids, rock wall climbing, three live entertainment stages, Jet Ski races, bathtub races, kiteboarding demos, beer pavilion featuring NFL football games, a wine pavilion and so much more! As always, there will be continuous entertainment, great food and beverage booths, commercial booths, exciting jet ski races, and various events to ensure a variety of activities throughout the day. Our extensive promotion efforts assure coverage in all media and attendance is expected to equal or surpass last year. The Pittsburg Seafood & Music Festival has developed a strong Vendor following over the years. The 100+ booths are lined along Marina Blvd, which is a level and well-maintained area. There is no natural shade. The Seafood & Music Festival is a green event. As such, we do not allow standard packaging products that are not organic, compostable, or recyclable. We anticipate another enjoyable, exciting and successful event, and encourage you to apply for space to display your business/merchandise at the 34th Annual Pittsburg Seafood & Music Festival. If you have any questions regarding the application form or application procedures, please call us at 925-432-7301 Monday through Friday at 9:00 a.m. to 5:00 p.m. 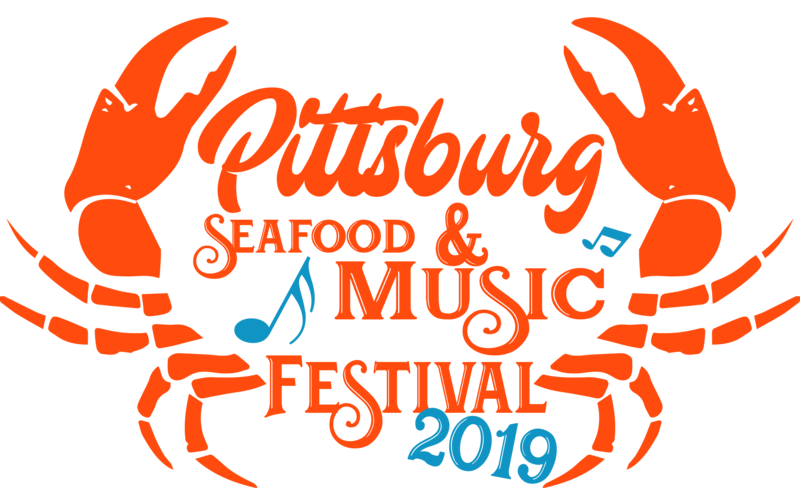 The 35th Annual Pittsburg Seafood & Music Festival will take place on Saturday September 7, 2019 from 10:00am to 7:00pm and Sunday, September 8, 2019 from 10:00am to 7:00pm. The mission of the Festival is to support local worthy charities and promote the community through a quality celebration of seafood and music. These goals will be accomplished by showcasing many unique quality foods and arts and crafts with our theme. Vendors are required to supply their own booth and must submit a picture of their set-up with application. All booths must meet the standards set by the Pittsburg Seafood & Music Festival Committee, Contra Costa County Department of Environmental Health, and the Fire Marshall. Booth size and appearance must be pre-approved. Applications will not be accepted after 5:00pm PDT, Thursday, June 27, 2019! Fees will be accepted only after an application has been approved by the Committee and a billing notice issued. Payment in full must be received by Thursday, July 18, 2019. Failure to meet this deadline will incur late fees and may result in loss of booth space. Applicants will be notified via e-mail in first week of August as to whether they are accepted or not. Those accepted will receive additional information, such as location assignment, parking, location maps, etc. Arts & Crafts/Merchandise Vendors: Only merchandise of the type submitted may be sold. $310 (10' wide x 10' deep) - Including $10.00 city license fee. $385 (15' wide x 10' deep) - Including $10.00 city license fee. $460 (20' wide x 10' deep) - Including $10.00 city license fee ( A limited number of double booth spaces are available). $150 10' x 10' Canopy Rental (If needed). $175 10' x 20' Canopy Rental (If needed). The Pittsburg Seafood & Music Festival is a green event. As such, we do not allow standard packaging and or marketing products that are not organic, compostable, or recyclable. There is no electricity in the Arts & Crafts/Merchandise areas. The use of generators, batteries and amplified music is prohibited. Battery-operated fans are allowed. Payment is due Thursday, July 18th. No exceptions. Space will be reassigned. Once notified of acceptance, any vendor's fee will not be refunded if he/she withdraws from the Festival, unless the committee is notified in writing by August 1, 2019 and there is just cause for such a request. NO refunds OF ANY KIND will be applicable after August 1, 2019. The Liability Insurance fee of $125.00 will be waived if you provide a $1,000,000.00 Certificate of Insurance naming the Pittsburg Seafood & Music Festival, Pittsburg Chamber of Commerce and the City of Pittsburg as an additional insured along with a letter of endorsement. If approved, you must submit the valid Certificate of insurance to the Pittsburg Chamber of Commerce office no later than July 18, 2019 . You, THE VENDOR, must be in attendance at your booth during the hours of 9:00 a.m. to 7:00 pm on both Saturday and Sunday. Do not send friends, family or paid representatives to replace you. Your presence is required. Bring enough inventory for two (2) days. If you leave early you will not be allowed to participate the following year. Please make sure you have a way to get additional inventory without everyone leaving your booth. Applicants must submit a listed description of merchandise sold (including price range if applicable). Additionally, applicants must submit four (4) photographs of their merchandise/give-aways and booth setup. One (1) photo of their booth display, (2) photos of merchandise/give-aways and (1) photo of marketing materials. You are required to provide proof of general liability certificate in the amounts specified above naming the Pittsburg Chamber of Commerce and the City of Pittsburg as additional insured. You must also include an endorsement letter with your certificate of insurance, OR you may purchase general liability insurance from the Chamber for for $125.00 to cover this special event. Should you have any questions regarding the declination of coverage, the Pittsburg Chamber of Commerce at (925) 432-7301(925) 432-7301. You also are responsible for providing the stated amount of automobile liability insurance. For more information, contact the Pittsburg Chamber of Commerce staff.